My bandsaw lives in the garage. The garage is really more of a shack. Well, it was a shack but now it is a run down structure housing garden tools, a variety of wildlife and my funky old 14″ imported bandsaw. The biggest quirk is the way raising or lowering the guidepost throws the upper guides far out of alignment. There is no adjustment to fix this problem on this particular bandsaw. I have learned to compensate for this and can usually tweak a setup very quickly before sawing. Once set up the saw works very well. The wheels turn and the blade goes around and wood gets resawn. There is not much more I can really ask for from a bandsaw. 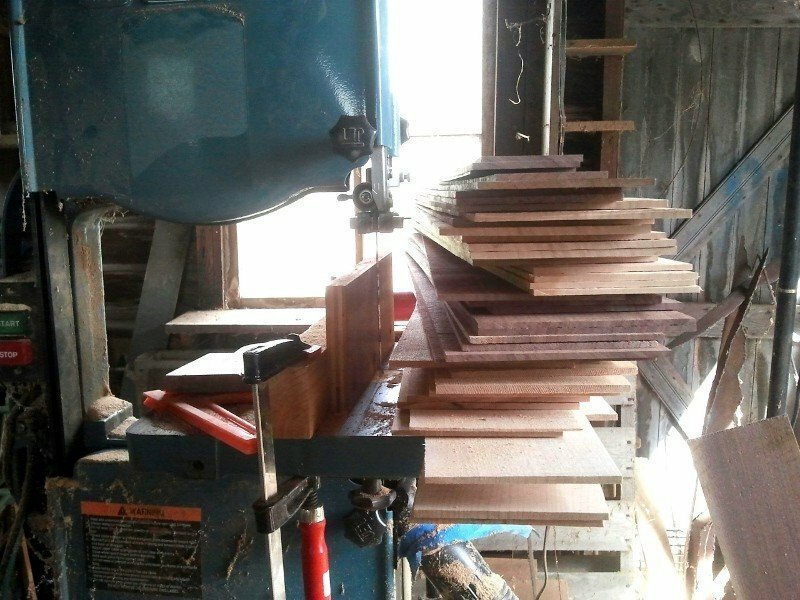 There are various methods for getting a bandsaw set up to produce slices of even thickness. Some people angle the fence to compensate for blade drift, some say a properly tuned bandsaw should cut straight and true without compensating the fence for blade drift. I do whatever works for me and that seems to change from time to time. I use a 1/2″ blade with 3 teeth per inch. My fence is a piece of plywood screwed to a chunk of 2×4 held to the table with 2 clamps. I use a square to get the table, fence and blade square with each other. Sometimes the bottom of the fence needs to be shimmed with pieces of tape to get it square to the table and blade. I make a few test cuts and if there is a problem with blade drift I compensate the angle of the fence till the cuts are straight. Then comes attention, patience, and a lot of sawdust. Bobby J Ratliff: You are not alone! Better bandsaw have either better machining, adjustments for the guidepost or both! Still, once set up most tend to get the job done. I know some ancient agrarian incantations that help make machines like this function. . .
and I thought my bandsaw was the only one that did that!